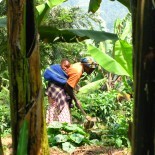 My experience in Kabale with KIHEFO has been enlightening, challenging, and thought provoking. Although I am not pursuing a career in the medical field, I still found ways to help KIHEFO and learn from the physician’s assistants, nurses, and staff at the clinics. The first two weeks were an overall orientation to Kabale and KIHEFO. We met with many of KIHEFO’s partners and attended outreach clinics to communities in and around Kabale. Although at this point I didn’t know too many details about the rain water harvest systems that I would ultimately be writing grants for, attending clinics helped to shape the story within the grant. Sitting with Bruce in the General Clinic provided insight into some of the most commonly diagnosed conditions: PUD, UTI, dehydration, PID, and various skin rashes. Between patients, I would ask Bruce the cause of these conditions and it became clear that access to clean water played a role in the prevalence of these conditions. Had I not been encouraged to attend clinics, despite a lack of medical background, I would not have understood the scope of the access to water problem. By the third week, we were beginning to focus on our specific projects and initiatives that had sparked our interest. During this time, I was instructed to meet with Atayo and Grant to discuss the two rain water harvest systems that would require grants. Atayo took time out of his day to show me the household system that had been installed in six households in Kyanamira, a community in Kabale. We were able to do the 5km walk from the protected water source to the community uphill to simulate the daily experience of these families that are forced to travel long distances to bring clean water to their families. This walk alone helped me to better understand what was at stake. Atayo introduced me to two families and I got the opportunity to learn how each had chosen to use the local water supply they had been provided. One family meticulously rationed their collected water for consumption and food preparation purposes while the other chose to use their water to build an additional structure to their home for their growing family. As a result of these systems, these families were able to have the flexibility to take control of their resources and choose what worked best for them and begin to control their surroundings despite harsh conditions. The perception of Uganda and quite honestly, Africa, is highly stigmatized. The internet tells us that people in Uganda live in a sad poverty. However, Kabale, Mbarara, Kampala, and the many communities we visited exhibited quite the opposite. While poverty, disease, and ignorance are apparent, the people are incredibly gracious, friendly, and welcoming. I have never felt so loved and supported in a community I only knew for a few weeks. I wish I had known how quickly four weeks would fly by. When you are signing up for this learning opportunity you feel as though you’re signing away your life for thirty days. If I could change one thing about this experience, it would have been to extend my trip to the full ten weeks. I look forward to continuing to work with KIHEFO on grant writing and can’t wait to visit the family and friends I made in my short time there. I also have to include a shoutout to the squad that always made me laugh harder than the day before: Andrew, Chelsea, Christina, Deiundra, Hunter, Julia, Rachel, and Sarah. This entry was posted on July 28, 2018 by KIHEFO in Welcome from KIHEFO.